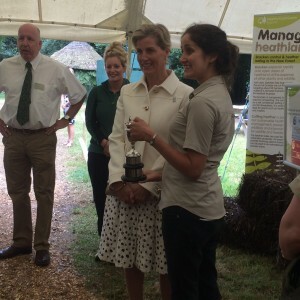 Dr Annie Ockelford from the Aquatic Research Centre was part of the team helping the Forestry Commission promote their Higher Level Stewardship (HLS) scheme at the New Forest and Hampshire County show this week. The HLS scheme seeks to return some of the New Forest’s rivers back to a natural, meandering state and as such restore the health and biodiversity of the rivers within the New Forest. Visitors to the stand were able to experiment with a ‘River in a Box’, a sandbox where the shape of the river can be controlled and manipulated to show different scenarios. This demonstrates how changes to river channel dimensions can affect flood risk and shows how restoring rivers back to a meandering course benefits habitats, ecology, fisheries and people. Annie said ” The New Forest Show is one of the top agricultural shows in the country, attracting over 95,000 visitors over three days so it has been great to accept the Forestry Commissions invite to spend three days exhibiting at the show. 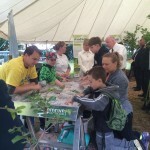 The response to ‘River in a Box’ and the whole Forestry Commission stand in general has really shown the importance of outreach and inspiring the next generation. 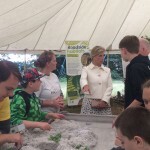 The visitors to the stand were informed and engaged and it has been a fantastic event for promoting the importance of the work undertaken by the Forestry Commission as well as the discipline of geomorphology. 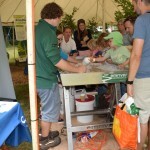 The stand was co-organised between the Forestry Commission, the Universities of Southampton, Hull and Brighton and the British Society for Geomorphology. Annie was there in her capacity as the Chair of the British Society for Geomorphology Outreach Committee.